Charles Lucas was a curate in Avebury for several years in the 18th century, during his time there he wrote a long poem about the stones called The Old Serpentine Temple of the British Druids at Abury, which was published in 1795. He was angered at the destruction of the stones by local farmers and also heavily influenced by reading William Stukeley’s book, Abury, A Temple of the British Druids so that the idea of druids and serpents lay at the heart of his interpretation and writings about the great stone circle and henge of Avebury. Also an 18th century preoccupation with the ‘pagan stones of the druids’ was a very popular concept at the time, still sadly in our time as well. So what does he offer us in the 21st century? Firstly, his anger at the destruction of the stones by local farmers, secondly of course his 18th century eye witness account of stones that were actually in existence at the time, such as the stones of the Beckhampton Avenue; The Beckhampton Avenue was also visible though not so perfect as the other in the memory of the late Mr. J. Clements, who could clearly point it out. This has been chiefly demolished by Farmer Griffin and Richard Fowler. The two stones in the Cove are all that now remain, and with difficulty these were saved by applying from the farmer to the landlord. The Avenue, though fairly complete towards the Marlborough end, lost many stones nearer the village during the time of William Stukeley; A Mr. Smith informed Dr. Stukeley, that when he was a schoolboy he remembered the Kennet Avenue intire from end to end, and by the time that Lucas was writing; The stones from the neck were taken by a Mr. Nalder by order of the landlord Mr. Grubbe to build the farmhouse, now Mr. Tanners, and most of the Kennet houses are built from that part of the Avenue. I suspect it is difficult to judge these farmers and house builders with hindsight, though Lucas has a few tidy words in his poem to express his anguish. Though again ‘hare-brained speculatists’ are at work this very year on the boundaries of Avebury with the five new houses being built at the former site of Bonds Garage just outside the henge on the Swindon road! History has an unfortunate way of repeating itself. So shall we name these miscreants from the past, long dead and buried in their graves, they chose to destroy the stones as best as was possible in their time, was their no over-arching power to stop the destruction of the stones? The answer of course is no, short term gain normally wins the day when it comes to profit, though Farmer Robinson seems to have lost out; The destruction made by T. Robinson was chiefly in the Temple of Avebury, under pretence of building houses, but the experience of demolishing (the stones) was greater than the value of the houses, and after they were built the houses by some accident burnt and T. R. utterly ruined. A further interesting point in the poem is the presence of the two earlier north and south circles with the great obelisk stone in the centre, these circles have a date of approximately 2900 bc. The obelisk is toppled to the ground in Stukeley’s time but still a giant as it lay there, Stukeley recorded it thus “The central obelisk of this temple is of circular form at base, of a vast bulk, 21 feet long and 8 feet 9 inches in diameter; when standing, higher than the rest“. In the following link from that invaluable site; Avebury A present from the Past, it is stated that the obelisk is the central and most important feature (and also the Cove of course is earlier) from which all the later large stone circle and henge would have been built around. Here is what Charles Lucas has to say on this earlier complex. To which they ty’d the victim; and another. Well putting aside druidical sacrifices, we are left with a fairly good idea of how the Avebury complex may have looked in the 18th century, many stones fallen and buried; the slow accumulation of a ritual landscape from the ‘stone age’ over time with ceremonies that we know little of now, had fallen victim to changed farming ways and more practical necessities such as stone for the new farmhouses and cottages. William Stukeley did a great service when he sat down to record by drawing and the written word the landscape he saw before him, already beginning to disintergrate, that his imagination coloured his thinking is something that can easily be forgiven. Charles Lucas, impressed by the scholarly Stukeley also put pen to paper to record his impressions sometime later, such historical records are invaluable. 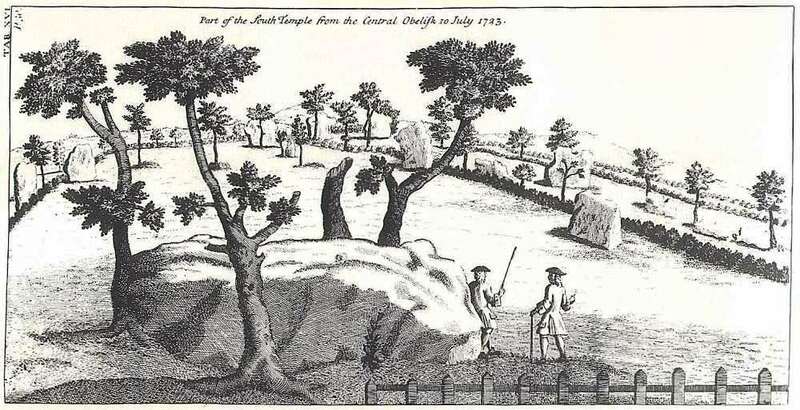 Ref: Online Google book: The Old Serpentine Temple of the Druids at Avebury by Charles Lucas. 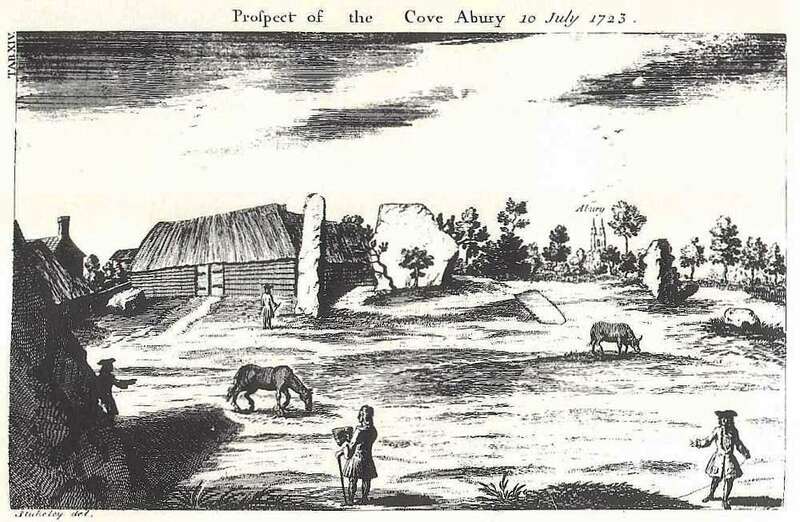 Abury, a Temple of the British Druids, William Stukeley. You say, “A Mr. Smith informed Dr. Stukeley, that when he was a schoolboy he remembered the Kennet Avenue intire from end to end, and by the time that Lucas was writing; The stones from the neck were taken by a Mr. Nalder by order of the landlord Mr. Grubbe to build the farmhouse, now Mr. Tanners, and most of the Kennet houses are built from that part of the Avenue”. Do you know what is being referred to when Lucas says that ‘the stones from the neck were taken by a Mr. Nalder? What was the neck? Sorry Moss, I read your post again then realised that the ‘neck’ would have been the neck of the serpent mentioned earlier in your text. Well it is only Monday you know!! 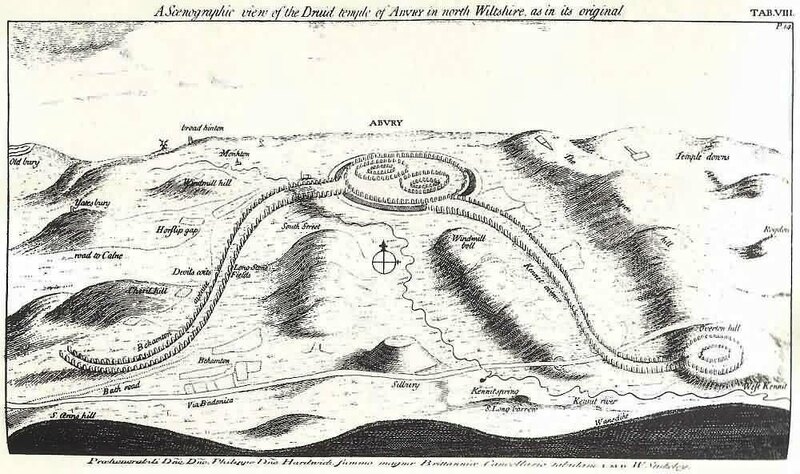 Yes if you look at the first photo of the ‘serpent’ the neck coils round in the vicinity of the Sanctuary circle at Kennet, which Lucas refers to. The stones of the Sanctuary were also still there in Stukeley’s time but disappeared after, presumably used as well for building or maybe even roads. « Thatcher’s children return to Avebury 5 years and 265 years on.